2013 Denis Jamain Domaine de Reuilly, Reuilly, Pinot Gris, Loire Valley, France. This slightly pink Gris is sizzling with fresh intensity and loaded with mineral essence, making a dynamic semi white semi rose wine that is perfect for summer. This seriously charged wine from Denis Jamain’s Domaine de Reuilly has just a few short hours of skin contact and takes it’s cues from the unique soils and terroir from this cool and ocean influenced region of the Loire. All of Jamain’s wines are full of driving acidity, mineral and are remarkably poised in presentation, and are especially good with seafood, with oysters and summer fare, these are vibrant, vivid and delicately flavored wines that are refreshing and pleasing in every way. 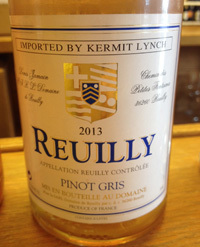 The 2013 Domaine de Reuilly Pinot Gris, as mentioned has a slight pinkish tint with salmon hued edges leading to a palate of red citrus, grapefruit, green apple and faint hints of wild peach, melon and has a steely core, along with a bit of saline, spice and an impression of cherry/strawberry. This stony off white is strikingly dry, crisp and bracing, but not severe or harsh, it just begs for another sip and is mouth wateringly good and joyous.